In his years as president, Fr. Theodore Hesburgh always kept his office door open to students who wanted to visit him, even in the middle of the night. 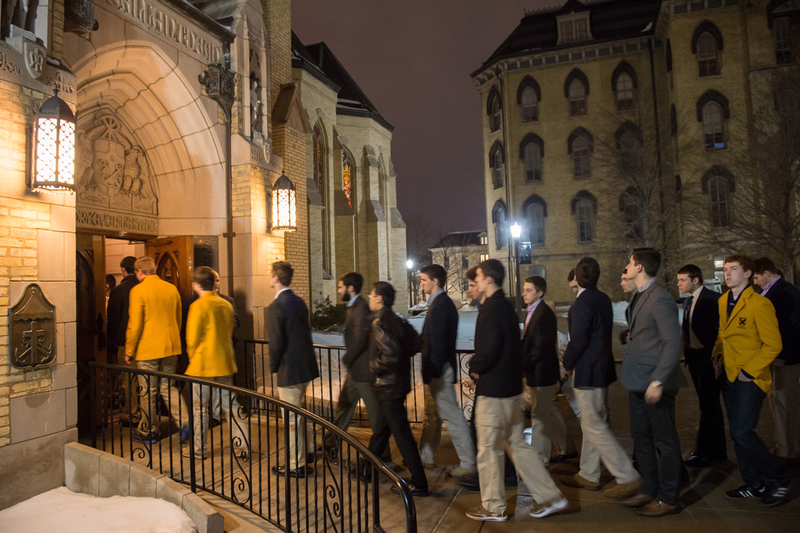 And all through Tuesday night into Wednesday morning, students took him up on the offer one last time, visiting the Basilica of the Sacred Heart in a steady stream through the night to pay their final respects. “It says a lot that even though we didn’t get to experience everything he did, or we weren’t there during his most active times, we’re still here tonight,” McGlinn sophomore Priscilla Quaye said at 2 a.m.
Residence halls were assigned priority hours through the night to organize the flow of people. Even at 1 a.m., the wait time to enter the Basilica and proceed through the lines inside was about an hour and a half. For some students, this was the first time they were able to see Hesburgh in person, and they didn’t want to miss the chance to say both hello and goodbye. For others who had met Hesburgh before, the night was equally powerful. “I met Fr. Hesbrugh during my freshman year, and he was just such an amazing person who had contributed so much to Notre Dame and to civil rights and to a lot of different things,” Keenan Hall senior Samuel Leung said. “So for me, it was very important to be able to give respect to this man. A tent set up outside the Basilica kept visitors out of the 20-degree night as they waited their turn to go in. Once inside, students were ushered into lines and made their way through the Basilica to stand before the casket, two by two.